I know someone who uses frozen biscuits. I'm kind of ashamed to type this but here goes. I'm a working mom. This is one of my daughter's favorite meals. I just don't always have time to make them from scratch. I read where someone uses flour tortillas strips. I tried it and my daughter didn't know the difference. She knew I was up to something because she kept commenting that she didn't see me make the dumplings, lol. I swear I saw her looking in the trash can for evidence! Now we have a recipe for weeknight chicken and dumplings. It's joined with weeknight spaghetti, weeknight lasagna, and weeknight chili. Wow thanks so much to all, maggie2101, you were right, that is a great receipe, cannot wait to try it as well as the others. My mother used refrigerated biscuit dough. I like the idea of using the frozen biscuits, too. Thanks! I've always had good luck with Bisquick. I am going to try the recipe out for dinner tonight. Yummo! 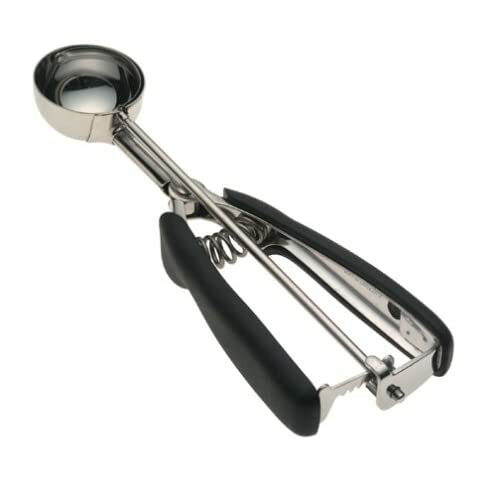 I use one of these sprayed with cooking spray to scoop out the dumpling batter...works like a charm. I just had to laugh. Quick, Easy Dumpling sounds like a Bavarian stripper name.